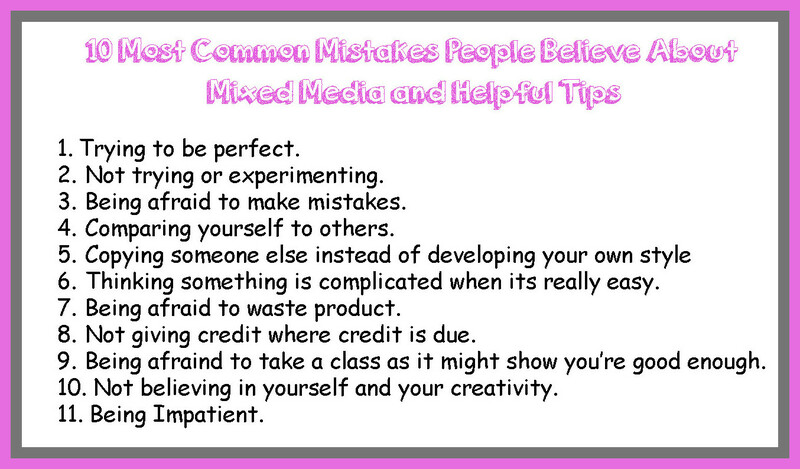 I have a new video on my youtube channel featuring the 10 most common mistakes people believe about Mixed Media with some helpful tips. watch below and if you can think of any other ones please comment either here on my blog or in the description area. I’ve summarized them in a chart below as well but watching the video will help you understand what I mean by each one!! I actually wanted to make a quick message to say thanks to you for some of the lovely information you are writing here. My time intensive internet look up has finally been recognized with professional insight to exchange with my family. I ‘d suppose that most of us readers are unequivocally blessed to live in a fine site with many awesome individuals with very helpful things. I feel somewhat blessed to have encountered your web pages and look forward to really more fabulous moments reading here. Thank you once more for everything.